Victor Hugo’s decades-spanning novel Les Misérables has been the subject of countless adaptations since its initial publication in 1862, the latest of which hails from The King’s Speech director, Tom Hooper. He has stripped the tale of ex-convict Jean Valjean’s quest for redemption through revolution-era France down to its core and captured the fraught emotion and difficult subject matter – poverty, prostitution, crime and corruption – through powerful, live on-set musical recordings, an impassioned ensemble cast and well-built imagery. 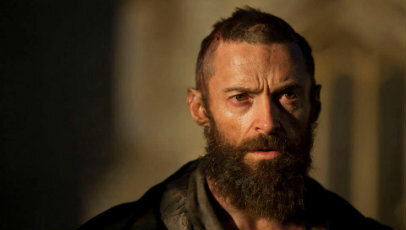 Released from prison after a severe nineteen years under the strict supervision of Inspector Javert (Russell Crowe), Jean Valjean (Hugh Jackman) assumes a new identity and seemingly escapes his troubled past. However, when he strikes a deal with ailing mother Fantine (Anne Hathaway) to look after and raise her daughter, Cosette (Amanda Seyfried), he subsequently finds himself embroiled in the Paris Uprising, while still trying to evade Javert’s clutches as a result of breaking parole. Condensing Hugo’s sprawling text into a workable narrative was always seen to be the major stumbling block in adapting Les Misérables, but screenwriter William Nicholson’s interpretation, itself based on the hugely successful 1980′s Broadway musical, retains much of the novel’s theatricality, while also rooting it in a sincere, human reality, one that’s heavily fuelled by raw theatrics and each character’s individual efforts to survive in an oppressed, government-controlled and freedom-blocking France. The first half is spectacular in its intimacy, reflecting the struggles and inner distress experienced by both Jean Valjean and Fantine (her downfall from respectable factory worker to abused prostitute at the mercy of her desperation to protect daughter Cosette is heartbreaking, captured in the lyrics of “I Dreamed A Dream”) through production designer Eve Stewart’s dark and enclosed Parisian underworld. Both Jackman and Hathaway are stand-outs here, delivering subtle yet powerful performances loaded with deep sorrow, reflection and longing. When the film enters its second half and the scope is widened to include new characters and narrative threads (Cosette’s relationship with revolutionary leader Marius, played solidly yet unremarkably by Eddie Redmayne, for example, is made artificial by its over-the-top nature), Nicholson’s script struggles to maintain the raw power of earlier scenes, resulting in a second half that, while nonetheless interesting in its themes of rebellion and uprising, is noticeably lacking in the emotional honesty that made what preceded it so captivating. These issues, however, are mostly compensated for by an enthusiastic and extraordinary ensemble cast. The only weak links here are Crowe, whose performance feels somewhat awkward and stilted, and Sacha Baron Cohen who, along with Helena Bonham Carter, play the devious duo from whom Jean Valjean rescues Cosette from. Hooper’s direction, for the most part, is effective and complimentary to the intimate feel of the film, and the live on-set recordings work wonders in creating some truly naturalistic, deeply poignant moments. Les Misérables won’t be for everyone. The conflicts between characters are often too widespread (Javert is remarkably lenient towards Jean Valjean, someone he’s arguably supposed to hate), the attempts at comedy too strained and the film as a whole too sporadic to win over those not willing to invest in its impulsiveness and Hooper’s unconventional approach. But for those who are already fans of the source material, or those that can admire the beauty, hope, wonderment and mostly excellent singing while excusing the odd blunder, Les Misérables is a brave marvel. Unfortunately I am one of those not willing to invest. Good observation about the intimacy of the first act versus the second. The second act didn’t connect with me emotionally until the end. I’m looking forward to this, although sub-consciously aware that it won’t have the same impact as the show. I’ve always felt the the Cosette-Marius relationship is the most disposable part of the whole story so I’m hoping that doesn’t dominate too much!